The matting is planned to be fitted on 9th-10th March- route setting should be under way straight after this. As soon as this is done, we should be open! Prices are on the website- I will try to upload a registration file so you can complete this and save time when you make your first visit. 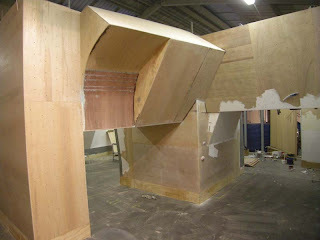 Last couple of days finishing off the construction- then it is a question of decorating and getting the matting in. The picture shows a new "wave" addition which will give some interesting problems. Andy and co. had constructed this section, along with a couple of others, but we had a spare section left over. It was too nice a piece of wall not to use, so this is where it ended up. Another photo, this time showing the slabby wall and the arete. The aretes will be featured, making for some interesting technical moves.